Lunch at Omote with KW. 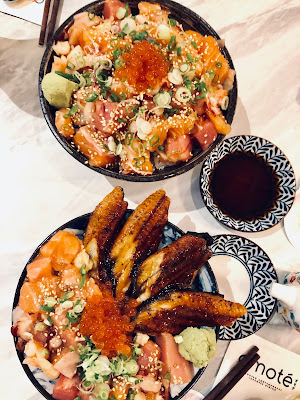 His upsized chirashi, mine with grilled unagi slices. Incredibly satisfying lunch. But more memorably, this elite school student beside me took a good 20 minutes to deliberate over what to order - and even had to did an instagram poll for her friends to decide. I sure had a good laugh inside.